I'd like to reiterate one of the points I made during yesterday's conversation with Anjannette: this blog is about so much more than melanoma. 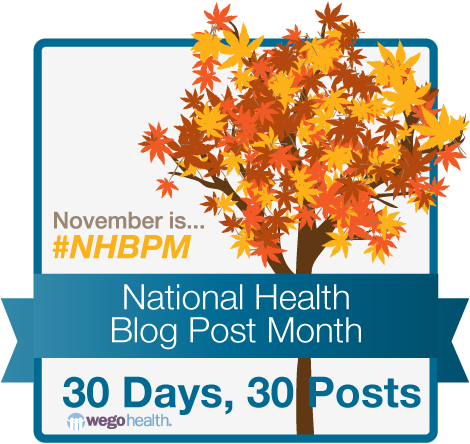 Unlike some of my fellow melanoma bloggers, I have been very lucky. I don't need to head to the doctor every three months for treatments, and I don't have to deal with the anxiety of frequent scans to make sure there's no evidence of the disease in my system. So that's not what you're going to find here. Even so, melanoma is frequently on my mind. I realize that what causes skin cancer varies widely from patient to patient, but for me, I strongly believe that using tanning beds in my teens is what gave me melanoma in my 20s. Consequently, I've become fascinated by why young people use tanning beds in the first place (even when they know they're dangerous), and more importantly, what we can do to stop it. This a huge undertaking--far too big for little 'ole me to tackle on my own. But I have some pretty exciting projects in the works for 2013. I can't wait to share these with you! I would never with melanoma upon anyone, but I am grateful that this experience has lit a fire under me, so to speak. I think I have the potential to become a strong advocate for melanoma prevention and early detection both in my community and across the globe. Who knows what life would have been like if it hadn't been for that dang little black mole. I'm just thankful that I've been able to twist such a negative experience into a positive one, and that I've found a cause I am truly, truly passionate about. 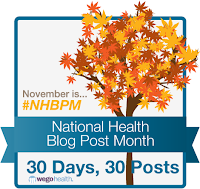 This post was inspired by the Day 29 prompt for National Health Blog Post Month. View posts by other participants. Love it! Like I said yesterday, you are going to do HUGE things for this world. HUGE! <3 ya!